Wear safety glasses, gloves and a mask when drilling or cutting wood. To keep saddles in good repair, with nice straight trees and evenly distributed padding, you should keep them on some kind of saddle stand or rack. 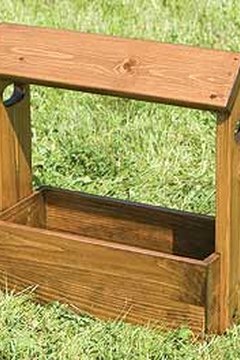 While this can be as simple as a padded sawhorse, a saddle stand that is wide enough to support most of the saddle's structure is a better solution. Measure 6 inches across the top of the first 1-inch-by-12-inch-by-2-foot piece of wood from the left corner and mark. Measure 6 inches down from the left corner and mark. Use the straight edge to draw a diagonal line between the marks. Repeat this on the second piece of wood. These pieces form the ends of the saddle stand. Cut the wood following the diagonal lines. Measure 1 inch in and 1/2 inch down from all four corners of two of the 1-inch-by-6-inch-by-2-foot pieces of wood. Stack two boards on top of one another and drill through the marks, using a 7/64-inch drill bit. Repeat for the remaining boards. These are the bottom sides of the saddle stand. Stand the end pieces (with the diagonal cuts) so that the broad end faces out. Screw one of the 1-inch-by-6-inch-by 2-foot boards to the edge of the end piece, flush with the bottom of the end. Repeat for the other end and bottom. You now have two bottom side boards attached to the two end boards. Screw the opposite ends of the bottom sides to the ends. You should now have a box-like structure, with the two ends standing upright and the bottom sides resting on the ground. Screw the top sides into the sides of the end panels at the bottom of the diagonal cut. Angle the remaining two 1-inch-by-6-inch-by-2-foot planks to make a V shape, and screw three L-braces into one side and then the other to secure the V. Position the V across the ends and screw three L-braces into each end of the V, attaching it to the end pieces. Sand all of the edges, and add a handle and varnish if you like.